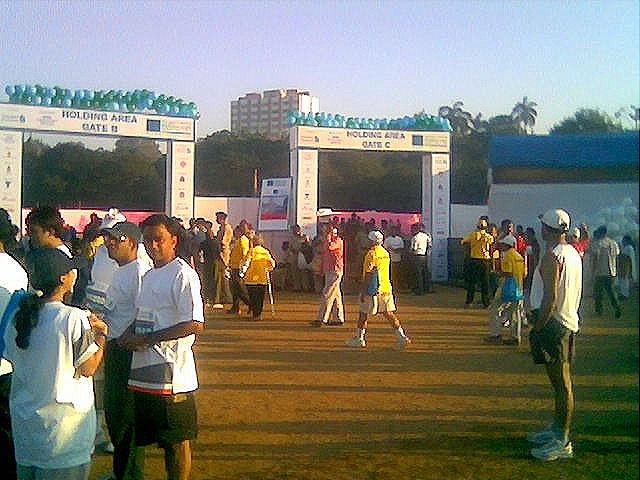 The Mumbai Cyclothon takes off on the 21st of February, 2010 here in Mumbai. p align=”justify”>The BSA Hercules India Cyclothon- Mumbai 2010 is a mass participative cycling event for professional, amateurs and the casual biker. The event intends to promote the cause of cycling and promote the various benefits. I have registered myself in the Amateur category i.e. 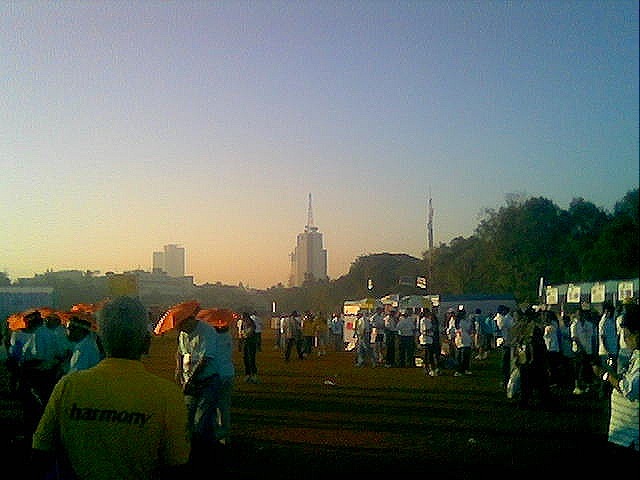 the 24 kms race. Cycles are not available to lease though registrants were promised that it was a possibility that they would be provided.That would be difficult since cosmopolitan India does not have a cycling culture yet! 24kms should be a breeze! I’ve been doing 45-50 kms on my stationary bike at home! 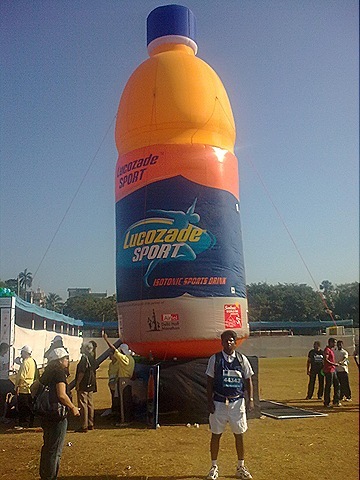 Have still not got around to purchasing one for the race, though I have made enquiries. I completed the Dream Run (6 kms) in 45 minutes. 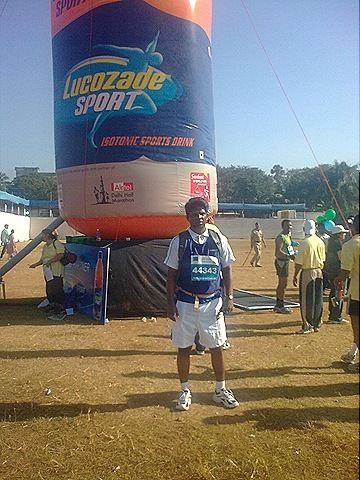 I have been doing 10 kms in an hour and 7 minutes, 9 kms in an hour , so I ought to have finished in 40 minutes. But the first 2 kms was not a run, it was folks having a party with no space to run and elbows jammed in your tummy if you tried to go past! 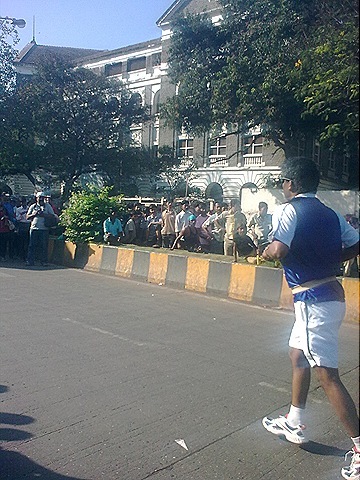 Some pictures clicked at Azad Maidan and me, nearing the finish! PS: Kindly don’t go nuts over the microphone! You know what I’m referring to! Just a taste of life in the light! 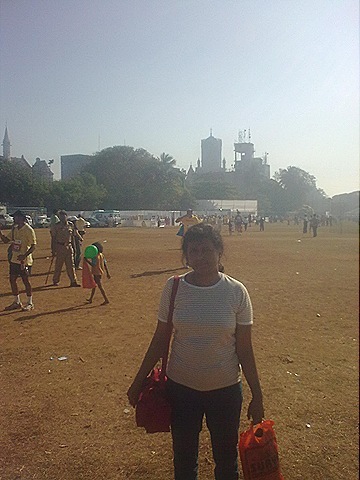 After doing the 6 km run this year, I will attempt the 21 kms next year, i.e. Jan 2011. I have located a few web-sites on running that give tips and schedules as how to prepare for both a marathon and a half-marathon. 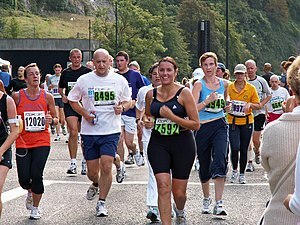 All said, running a marathon or a half-marathon is about endurance. It does not matter how much you run but how long you run! The longer the better! Of course distance counts but if you are a beginner, like me, then you should not concentrate on the distance and/or speed but focus on increasing the time spent running i.e. running non-stop. You can of course, choose to fortify yourself with water and small snacks. Hydration is very , very important. Carry a water bottle with you especially for the longer runs. As for myself, I will be training by running 3 times a week, supplemented by cycling 2 times a week (to reduce the wear and tear on my knees) and some light weight-training! Bulking up is out – makes it harder to run! You can find a program to follow on the web-sites listed or use them to create one tailored for yourself! Also, do not try to be rigid about your running schedule. Listen to your body! Rest when your body tells you to! Also, start early, so that you can compensate for slippages. Or sick time. Ensure that you have good running shoes. Change them as needed. Do check with your physician before starting any vigorous physical exercise! Start slow, be steady! Don’t rush where angels fear to tread! I haven’t seen the new Phir Mile Sur video in full as yet, just caught a small piece of the action, rather the ending last night. So I really have no comments to make. I did locate a blog post that describes the video and the blogger’s reaction to it. I did catch the Phir Mile Sur video! Yes, its very , very lengthy; watching it while I was stationary cycling was excruciating! Yes, it has mostly film stars, very few sportspersons and absolutely no ordinary folk, like you and me! Guess we’re not worth the screen time! Yes, it does not move you! You want to be moved? Watch the final 2 minutes only! PS: What is the best way to update posts? Add a comment or repost it as a new one? For now, I’ll stick to reposting! How bad is commenting oneself? Your views? Well, not me, at least not yet! But here’s an interesting post about someone’s blogging experience! I picked up my bib and a bag of goodies ( these were really a bag of goodies; probably recovered my entry fee from the stuff in the bag itself!) from the Expo Centre, at the World Trade Centre, Cuffe Parade. 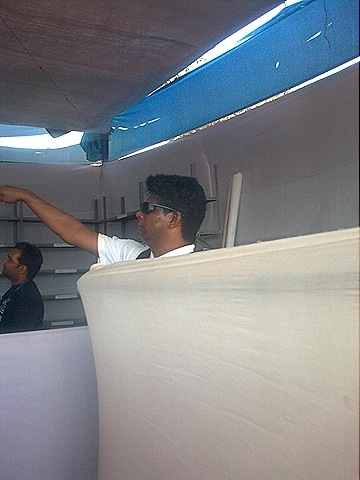 I backtracked so that I could click a picture of John Abraham on the podium with my antique phone camera! Good luck if you can make out John! I did not wait to hear what he or the sponsors had to say! 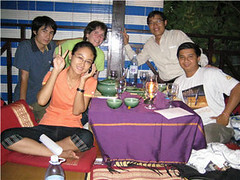 I do not believe I missed much. I caught 3 Idiots, the Aamir Khan starrer at New Empire. Remember New Empire? The movie was good, entertaining in parts, hilarious in parts. But I think it paints a very sorry picture of our education system. There’s an interesting article in today’s HT that talks about the movie. In my opinion, the movie is more about Rancho , than anything else. Also , Rancho , in the end, turns out to be a brilliant scientist, who owns more than 200 patents. Hey, wake up, no single individual without a nurturing environment such as a University, an R&D department funded by a firm, can hope to file so many patents. Patent filing is a time-consuming process and a huge headache. In this day and age, more patents are filed by teams of individuals and IBM is the leader with the no. of patents it creates every year. There are some indictments of our education system that ring true; But until we have more choice as to the kind of careers students can choose from, this is going to remain an endemic problem. So more power to the private institutions, they’re doing their bit even though it may be at the expense of harried parent’s pocketbooks! So if you wish to draw some lessons from the movie, it should be how can you make an entertaining movie like this or better? Aamir’s plea for a waiver of the entertainment tax for this movie seems to have its basis more in wishful thinking than in substance!